B2B marketers, listen up. You’re focused on generating leads. It’s your M.O. It’s what you live and breathe. But, let me ask—are you utilizing videos to boost your lead generation efforts? Video is a strong lead generation tool—a fact that is becoming more and more apparent to companies across all industries, from tech, to higher education, to healthcare. Through pre-video email gates, end-of video forms, and in-video CTAs, there are numerous ways to capture new contacts. Let’s explore 3 ways to infuse your marketing activities with lead-generating videos so you can hit your goals, all while getting the biggest bang for your buck. Landing pages are meant for conversion. But before you can get anyone to convert, you first have to grab their attention. That’s why the main purpose of videos on landing pages is to be catchy and engaging. Let’s say you’ve just written a snazzy new guide and you really want your audience to read it—but first you need for them to download it. Video can help you do this by luring people in through humor or captivating storytelling. That’s because videos are 12 times more likely to be watched than text is to be read. So, grab that attention and focus on creating something that people will want to watch. There’s no need to use video to go into detail about what your guide offers—that’s what your landing page copy is for. But once they’ve watched your video, they’ll feel more committed to your offering and will be more likely to continue on to the rest of your landing page content. The best practice for capturing leads when using promotional videos on landing pages is to use a call-to-action (CTA) or auto-redirect. A CTA at the end of your video invites viewers to take the next step (such as downloading the guide), and an auto-redirect sends viewers to the rest of your landing page immediately upon completion, thus giving them the opportunity to further engage with your brand. 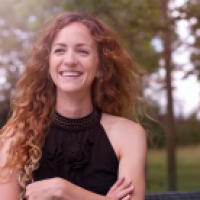 In a recent campaign promoting my company Vidyard’s Video Marketing Handbook, we used a catchy video personifying the handbook as a bit of an awkward trainer to get people engaged in our content. At the end of the video, we re-directed viewers to the rest of the page where they could learn more about the details of the handbook and fill out a form for the download. When your actual video is a high-value piece of content, like a webinar, you can do the lead capture right in the video itself. This is commonly used for stand-alone pieces of content. More often than not, these videos will be accompanied by an email gate or full form gate. This means that viewers can’t see your content unless they fill in their contact information. Which is the exact reason that you need to make sure you communicate the value of what they’ll be receiving in the webinar somewhere other than your video (more than likely this will be through your web page copy). Webinars are a great example of putting this into practice, since they offer a lot of high-value content, typically specific to one topic. Below is one example of including a form right on-page, prior to displaying the video. You can also use email gates partway through a webinar as a way to first show a teaser amount of content before asking viewers for their information in order to continue with the webinar. Product videos are some of the most commonly produced and most frequently viewed videos. If you’re not using them to capture leads, you might be missing a big opportunity! Though, let’s first be clear on the type of product videos I’m referring to in this scenario. I’m not suggesting you add any sort of lead capture to the explainer video that sits on your home page. I’m fairly confident that this would violate like 138 principles of content marketing and demand generation. OK, maybe not quite 138…but this stage is simply too early to ask buyers to provide their information to you. You’ll want to offer some free, un-gated content to them for the first stages of their buying journey. All in all—don’t ask for too much upfront. Instead, look to your lower funnel product videos and “pitchy content” to capture leads and build in video interactivity. Rather than just capturing the standard information of name, company, email address, and phone number, use these types of videos, instead, as opportunities to learn more about your prospects. For example, you may want to ask them what type of technology they’re using or how many vendors they work with on an annual basis. These questions will differ depending on your target persona’s profile; the ultimate goal is to capture information that will help you to better qualify your leads! To do this, you can add interactive elements like survey questions or polls into your video to build out prospect profiles. Not only does this allow you to capture more information about your leads, like which technologies they’re using or what their biggest pain point is, but it will also encourage higher engagement on these videos. While you’re hard at work ensuring all of your campaigns bring in the maximum number of leads, make sure video is pulling its weight, too! It’s a beast of a medium—so, I say, use its power! 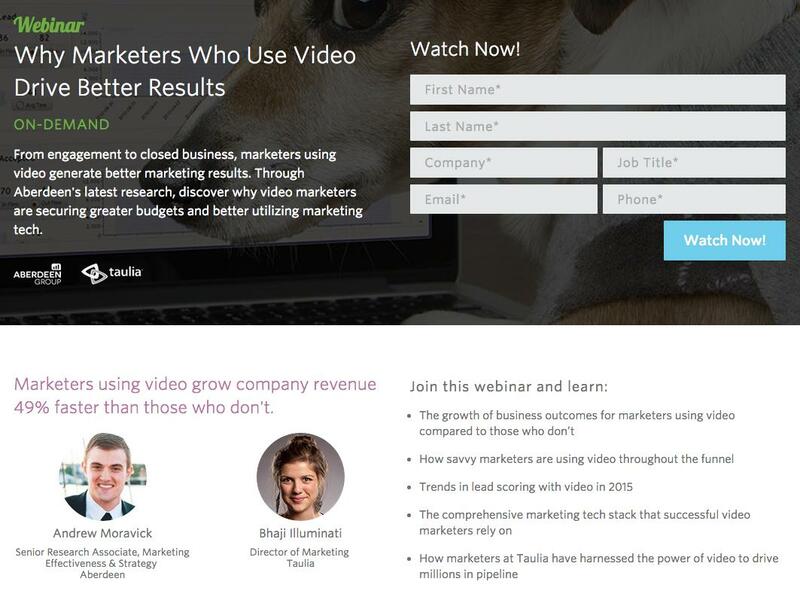 How has video worked for your team’s lead generation efforts? Let us know in the comments below!